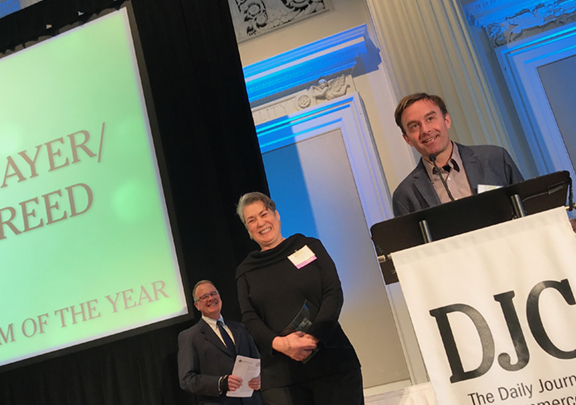 The Daily Journal of Commerce Oregon honored Mayer/Reed with the award for Landscape Architecture Firm of the Year during the 2018 DJC Newsmakers Awards event in Portland, Oregon. Mayer/Reed Associates Teresa Chenney, FASLA and Ryan Carlson, LEED AP accepted the award for Landscape Architecture Firm of the Year at the March luncheon. The Newsmakers annual award program recognizes “the built environment’s most interesting and influential people and companies of the past year.” The editorial staff at the DJC recognized Mayer/Reed for our work on current high profile projects such as the Willamette Falls Riverwalk in Oregon City, the Hyatt Regency Portland, and the event plaza at the Oregon Convention Center. The City of Portland is walking its talk. 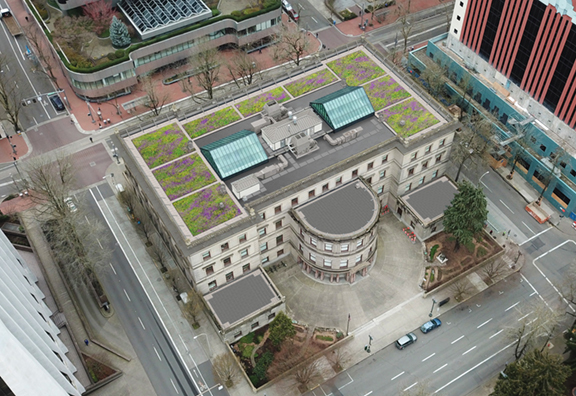 The historic City Hall will receive an eco-roof to underscore the city’s Green Building Policy and its commitment to sustainability. Approved last week by the Historic Landmarks Commission, the eco-roof design must be compatible with the 1895 building’s historic character, including views from the surrounding towers above. Mayer/Reed’s formal layout creates panels of framed sedum plantings over areas of roof that can withstand the extra saturated weight. As part of a roof replacement and exterior surfaces renovation led by Architectural Resources Group, Mayer/Reed designed the eco-roof to be economical and low maintenance, while maximizing ecological and aesthetic benefits. Initially, the team wasn’t sure that an eco-roof would work due to weight, but then determined that a thin profile cinder system would meet requirements. The eco-roof will feature a mix of 12 drought-tolerant plant species including sedum and flowering bulbs to create seasonal interest. At certain times of the year, the vegetation will be take on a red hue, rather than green.